I had a conversation with Pete Petrusha, creator of Dreamchaser and owner of Imagining Games, on twitter about his game. After getting the chance to play it, with notorious RPG Academy hosts Michael and Caleb, I stated that we had “played pretend with just enough crunch to make it a specific game”. I eventually followed it up with mentioning that “That’s all Tabletop games are right? Playing pretend with varying degrees of crunch”. Now, I’m not even the 100th person to say this, it is no special revelation, but there is something special about the Tabletop RPG Dreamchaser that call to mind the “let’s play pretend” aspect of these games more than anything I’ve played in recent memory. Dreamchaser is a Tabletop RPG that eschews a specific setting, concrete character classes, or even character abilities. The game outs the onus on the players and the GM to craft these things solely through their own imaginations. Players are encouraged to dream up simple scenarios they might have always wanted to do in an RPG that, for whatever reason, systems in the past haven’t been conducive to. Keeping things within simple phrases, maybe they’ve always wanted to “Climb the (mountain, world tree, tallest building)”, or defeat the (dragon, BBEG, evil god)” you get the idea…maybe even they simply want to “Make the perfect sandwich”, though that is not nearly as simple as it seems from what we found out! This then becomes how your story ends, and getting there requires some milestones and your own imagination. Obviously it’s is an open system, and one that puts no small amount of pressure on the players to help with crafting the game the group plays. I have not always been a fan of this personally. Many players love it and you’d think I would as well given my background in Improv Theatre and general love of both playing and running games. Frankly though, when I play I like to react to my environment, and effect change to the narrative in that fashion, more than I like to be the impetus of everything going on around me. If I wanted to control the narrative, I’d simply run the game. For example, when I played G.I. Joe Wushu almost a year ago on the RPG Academy Podcast I had fun but the constant need for me to explain the details around me was a bit overwhelming. I didn’t think I’d like playing another game where the I had to be a driving force for so much of the plot itself, but I was wrong. Where Dreamchaser succeeds is how it handles these player driven narratives in a more collaborative fashion. Sure there are aspects of the game that only you can come up with (mostly character details), but even from the onset when people are adding their “dreams” to the pile of potential picks they get to play off each other’s choices and come together with the ultimate end game scheme. Throughout the game there are numerous times where everyone works together to drive the story along, but it is almost always collaborative. Every now and then, in a heated situation, a player will have to strike out on their own and relay the scene to everyone else but by then the player has developed skills and abilities that can be easily used to narrate the sequence. Add in a simple rolling system, 2d10’s where you are attempting to roll beneath whatever target number is being dictated by your skill and style of approach to the confrontation, and you have just enough crunch to ground the game into a pretty smooth flow. I think Pete has something special here. Granted if you’re a crunch lover who genuinely likes the rigidity of systems requiring tactical moves, group balancing, etc. you’ll not find as much of that here, and that’s ok. However, if you want to play a game that leans toward a player driven story-line with a strong enough mechanic backing it to allow for surprises and interesting challenges, you’ll find it here. Plus, the fact that Imagining Games found a way to incorporate starting from the end to truly make the game about the journey adds a remarkably satisfying gameplay element to it. For a game so new, it feels polished. In my opinion, this game is a no brainer. Buy it, love it. Adore the amazing artwork! Here are my suggestions for levels to back at. I personally backed this Kickstarter (something I don’t always do, even if I adore the product). I loved the game and I trust Pete to deliver. However, I don’t have a lot of capital so I backed at my reccomended “poor guy” level “Electric Dreams”. As you can see, it gets you everything you need to play the game. It just doesn’t provide that satisfying tangibility of a physical book. For a level that’s pretty much the “get it all” level, $65 is a pretty great price point. So head on over to the Kickstarter folks! Let me know your thoughts below and, by all means, if you have any questions about the game you feel I didn’t address ask away. Having had the unique pleasure of playing I can likely give you an answer or I can always punt to Pete who I’m sure will answer quickly. Take care dreamers! Burning Games is back on the scene after successfully funding their 2015 Kickstarter run for FAITH: The Sci-Fi RPG. FAITH Core is one of the best example of blending your standard Tabletop RPG with board game elements like decks of cards and card stock character sheets. This time they are attempting to fund a Starter Set and full campaign path for FAITH named A Garden in Hell. Typically I start plugging Kickstarters I like day one but I took a measured approach to this one because I had a good feeling from the start that they’d hit their fund mark easily. I’m most likely not wrong either. With 23 days to go they already sit at 87% funded, more likely a “when are they going to fund” than an “if” at this point. Given the quality of the parent system, check out my unboxing video for more on that, I have no doubt that A Garden in Hell will be one solid game. A perfect addition to someone’s library of games that wants an intro into this system for their players. This new addition to the FAITH line isn’t just a Starter Set for those new to the game, it comes packed with new content so those who already own FAITH: The Sci-Fi RPG are by no means left out. I had the opportunity to see a preview copy of the actual Campaign book. The 30 pages previewed were detailed and helped explain gameplay well. Not to mention filled with the excellent artwork I’ve come to expect from Burning Games. Skilled Gardner $33 ~ This is the first level that gets you a copy of the game, in addition to some preceding digital items. I like it because it creates a cheaper selection for a physical copy by removing any stretch goal rewards. There were some backer levels that got you a copy of the core game but those got snatched up pretty quick! Who knows, maybe a few more might open up. Keep tabs. Please do yourself a favor and check out this excellent game system with A Garden in Hell! More than a year ago I found myself lucky enough to have been introduced to Michael and Caleb over at The RPG Academy and, by happenstance, join them on a few recorded actual plays, namely featuring projects introducing themselves to the world via Kickstarter. At the time The RPG Academy was doing pretty well for itself as a Podcast, but it was also pretty apparent that these two guys wanted to do more. Honestly, as someone who barely keeps up with Melvin Smif’s Geekery and my games stewardship work I have a hard time fathoming the work put into “just” a podcast, let alone tacking more on top of that. They had the hunger though, that much was easily visible. 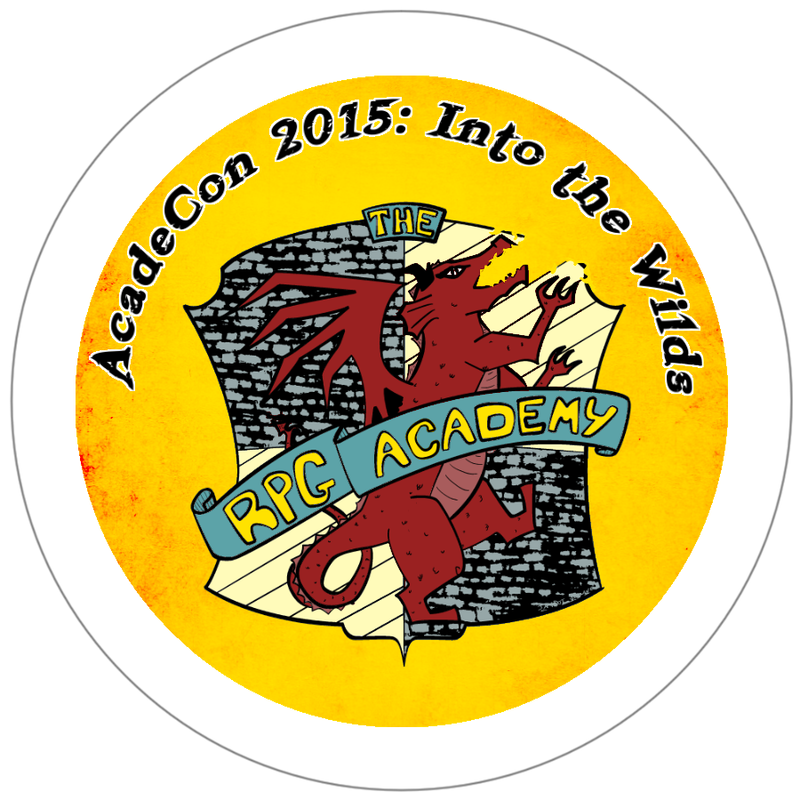 In late 2014 I made a promise that I’d attend their 2015 AcadeCon convention. It sounded great to me, even if it was set to simply be held in one of their basements. I mean, Ohio was only about 4-5 hours away and I wanted to meet these guys face to face. Then… the rest of 2015 happened. Suddenly I’m an early member of The RPG Academy Network, and soon following I find they have bigger and better plans for AcadeCon than I could guess. A date is set, a venue (beyond the basement) is chosen, a Kickstarter is set up, and AcadeCon 2015: Into the Wilds is suddenly upon me roughly a year after I started even speaking with these two guys who I now considered fast friends. AcadeCon 2015 was wonderful, a perfectly secluded gaming retreat that the new AcadeCon attendees of this year and future years will always kick themselves for missing out on. Truly it will be the “I was there when” place for AcadeCon. I adored the Hueston Lodge and wish I could get a few more years there but, as I’ve come to find with Michael and Caleb, the bar needs to be raised. This year things are growing, not too fast but we are certainly going to see a bigger, better convention. I for one am more than excited for the growth. They don’t have it yet though, that’s where you all come into play. You see, for a convention to be successful you certainly need the things they already have lined up, merchants, a crazy fine list of special guests, a dedicated staff, a great venue, etc. They just need one last thing…you. The last puzzle piece to making AcadeCon 2016 as fantastic as possible is to rustle up some actual attendees! The Kickstarter can do the best job of detailing everything you need to know about the convention on a macro level, like its truly inspirational abundance of special guests (I know I mentioned this before but it is really staggering all the cool folks they have lined up), but I want to mention a few things Melvin Smif’s Geekery specific you can enjoy. The number one thing is that I’ll be there in the flesh if you’ve every wanted to meet me…or use me as a gateway to meeting someone else I know :P. To add to this I’m going to run something or many things depending on how things shake out. Hell, this year I’m bringing my Warmachine faction so if you’d like to whoop up on some elves come fight my RoS! I’ll be running a contest connected to AcadeCon again, though I haven’t decided what that will entail just yet. So keep your eyes on the blog! Attendance of the Con won’t be necessary of course but it’d be awesome to hand you the prize(s) in person! I’m one of the folks you can choose to run a virtual game for you and some friends. You can see it on the KS page but essentially for $100 (up to 5 people) I’ll run at LEAST a one shot adventure online for you all. If you buy my services we’ll chat about what we want to play, I’m open to just about any system, and set a date! I’m willing to travel a bit for this too mind you, if you live close enough I’ll show up in person. This year is going to be awesome, I just know it. Can’t wait to see you there! Last night I finally got around to completing my Unboxing of this unique RPG. I’ll jump right to the meat of it, here’s the link. Now, this was a great chance for you to see some of the excellent craftsmanship that went into this game (and a little plug for AcadeCon of course). I make no secret in the video that I feel this product is of the up-most quality. However! Doing a blind Unboxing like that has its pitfalls, I couldn’t recall how to play the dang game… and it showed. A smarter Kevin would have gone back to his original review that came out during the Kickstarter run of FAITH, and done a little refreshing. That guy wasn’t around last night, he wanted to try his hand at the Unboxing and chose to dive right in. Well, for those who want to know a little more about the actual game, you’re in luck. The Kevin of today is feeling a bit more polished. Let’s review this thing shall we? Flip the gameboard over and the other side is in Spanish, nice touch! The punch-outs mentioned in the video (which I’ve just now taken a break and gleefully punched all of them out, flipping love punch outs!) are all for the players. Four boards of punch-outs contain this game’s version of a character sheet, only here it is a game board. Almost all of these pieces you can punch out have homes on this character game board. Utilize them to change stats with adjustable numbers, add or remove upgrade tokens, or when starting any game use the various character portraits to choose a look. Highly customize-able and useful for streamlining various aspects of the game. Another item I got a mite wrong last night was a side comment where I mentioned that the cards in the player decks might be something that works alongside your typical dice mechanics. This was wrong, there are no dice mechanics, only cards are used. The cool thing about this is it will allow players to manage their own luck in a way. They have a hand of cards to choose from, if they really want to succeed they likely can. That’s not to say they might not also take chances with lower valued cards, or even get a bad draw. There is still an element of chance, the players just have a bit more control. One of the only things I have a quibble with in this aspect is that there isn’t a GM’s deck of cards as well in order to get a bit of the same fun. I know why things like this are done, it streamlines the GM process, but I like it when I get to roll dice, or in this case deal cards. Some will very much appreciate the way the GM gets to run things though. We do get the NPC deck, that is a really cool toy, so maybe I should just be happy and shut it eh? You’ve seen all these physical items already though, I spent 19 minutes showing them to you (despite a bit of terrible lag… man I’m kinda bad at this). I want to chat a bit about the world of FAITH. Very much the Sci-Fi game it claims to be, FAITH takes place in a setting rich with multiple planets, sentient species (many playable races), and gods. Travel through space is done via a group of wormholes known as the Labyrinth. This connective travel network is alarmingly well put together, allowing for many theories to suggest intelligent design. A myriad of planets make up the habitable worlds that the six species you can play as live, work together, war together. The gods of FAITH are ever-present and have little to do with faith as we know it (despite the title of this game). They are attached to a believer via personality rather than choice and the gods expect you to follow their commandments. You are still left a choice however, you just might run into a very real consequence for disobedience. Some really interesting role-play opportunities there. If I had to compare FAITH to anything in its “feel” I’d go with the Mass Effect series or maybe even Destiny. Fully Sci-Fi with a hint of supernatural flair to it. The game is it’s own deal though, a ton of newness surrounds FAITH. Both the mechanics and the fluff turn some typical RPG tropes on their ear. I fully suggest you give it a chance. I know I’m going to get around to running a game someday, let me know if you’ve been able to or if you have any more questions about it below! Want to learn more about FAITH The Sci-Fi RPG? Check their site! Want to buy it? Here’s the Webstore.